In early February, Hypergiant Industries, which describes itself as “the AI industrial complex for leading global enterprises and governments,” said it was creating this new division by acquiring a little-known startup, Satellite and Extraterrestrial Operations and Procedures, formed to commercialize a smallsat deployer called Slingshot that was being tested for the first time on the latest Cygnus cargo mission to the ISS. So what will this company do? “Hypergiant Galactic Systems will focus on artificial intelligence-driven aerospace and astronautic software and hardware products for the booming space industry,” it said in a buzzword-laden press release. Ben Lamm, chief executive of Hypergiant Industries, wasn’t much clearer in an email exchange. The goal, he said, is to create a “full-stack satellite intelligence offering” that builds, launches and operates satellites, and then analyzes the data to extract insights for customers. “If you just buy a satellite imaging company, you’re gated by what’s already up there and the data they’re collecting,” he said. There are many satellite imaging companies, and others analyzing imagery. Will Hypergiant stand out from the pack in terms of the quality or quality of the data it collects, or how it analyzes it? “All of the above,” Lamm said. “While there is much work happening in this field, we feel that there is a method that has the potential to deal with various issues associated with such work that would represent a fundamental leap in how data are collected, downlinked, stored, processed, distributed and transformed,” he explained. He didn’t elaborate on what that method is, or when the company would implement it, or at what cost. At the very least, Hypergiant shows there’s no lack of enthusiasm about entering the industry, despite the growing number of companies in the field. However, it also suggests that the market may also be overheated, with too many companies chasing too few customers. But if the industry bubble is about to burst, many people in the industry aren’t too worried about it, yet. If there’s one part of the space industry that seems the most primed for a shakeout, it’s the small launch vehicle sector. So many ventures have announced plans to create rockets for dedicated launches of smallsats that it’s hard to keep track of just how many are in development. At events like the SmallSat Symposium in Silicon Valley in early February, it was common to hear estimates of 100 or more vehicles in work. Carlos Niederstrasser of Northrop Grumman Innovation Systems has been keeping track of small launch vehicles programs for several years. As of January, he had identified 112 such vehicles worldwide in various phases of development. That figure, though, includes at least 10 that have since gone defunct and another 10 whose status is unknown. Many of the others are still little more than concepts. 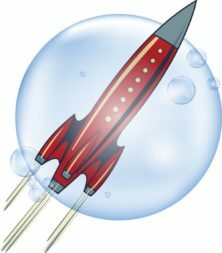 “I think it is 100 percent a bubble in the launch sector right now,” said Sunil Nagaraj, founder and managing partner of Ubiquity Ventures, during a panel discussion at the Commercial Space Transportation Conference Feb. 12 in Washington. He previously worked at Bessemer Venture Partners, an investor in small launch vehicle company Rocket Lab. Nagaraj thinks some investors didn’t do enough due diligence on the launch companies they’ve funded in terms of their capabilities. “Some of my brethren have pulled into this sector and invested without pulling back three or four levels into the technology,” he said. 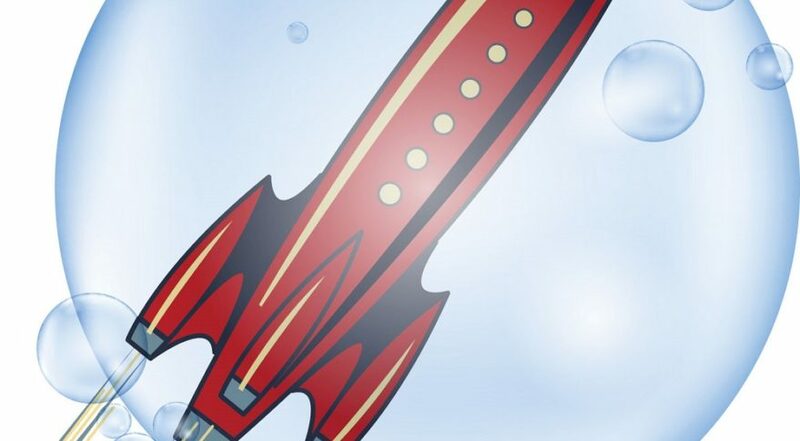 Small launch is not the only part of the space startup ecosystem poised for a winnowing. Emmanuel Sauzay, director of commercial space at Airbus Defence and Space, noted at the SmallSat Symposium that there are many companies planning smallsat constellations to provide Internet of Things (IoT) services. “There are a lot of ventures in the world right now doing IoT from space and how they differentiate themselves is not easy,” he said. Other sectors, though, may take longer to shake out. Broadband megaconstellations have attracted a lot of attention, but as companies like OneWeb start to launch their satellites, it’s too soon to predict success or failure for that company or any other entrant in that field. Adam Keith, an affiliated principal adviser with Euroconsult, expects the key period for companies in the Earth observation field to be 2020 through 2022 as new systems and new capabilities enter service. 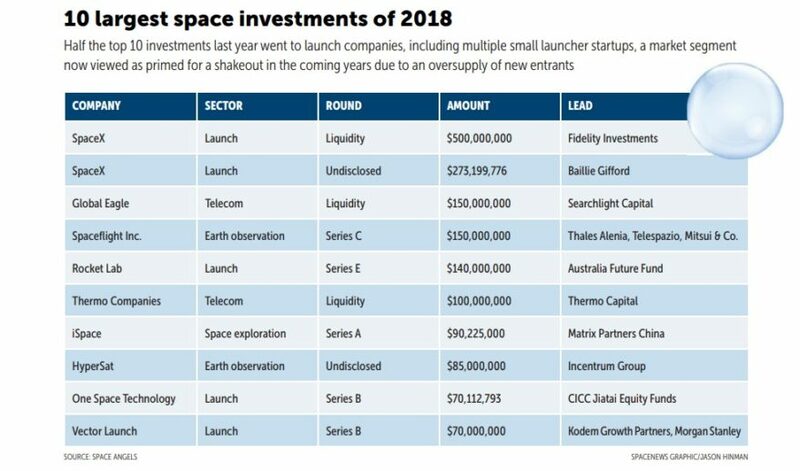 Investors, for now, don’t have an issue with emerging space companies as they continue to pour money into them. 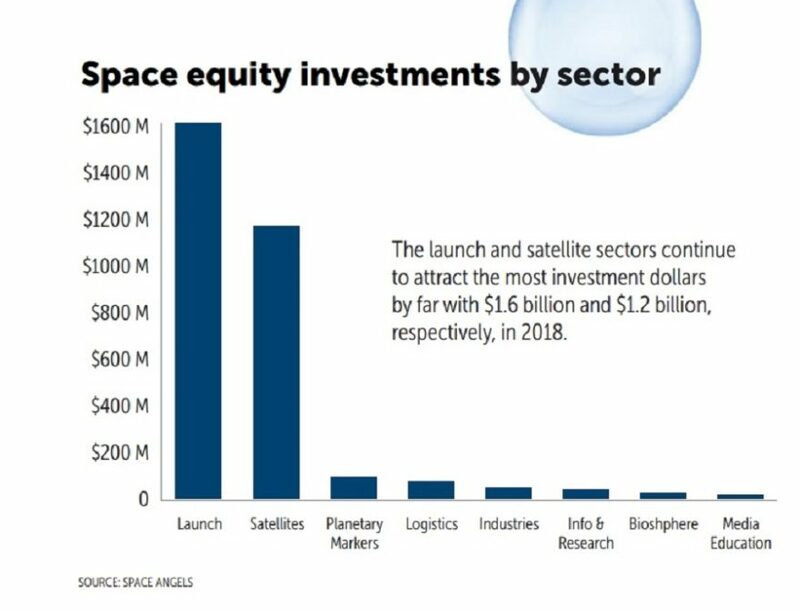 Space Angels estimated that there was $2.97 billion in equity investment in space startups in 2018, while Seraphim Capital, using slightly different criteria, estimated $3.25 billion in such investment in 2018. Both represented significant increases over 2017. Another panel at the conference, featuring investors from early stage venture capital to debt markets, were unanimous that investment would grow in 2019 even if there were signs of an industry shakeout. “It is my expectation that there will be a continued trend toward more investments at higher valuations,” particularly into “breakaway” companies in various market sectors, said Shahin Farshchi, a partner at Lux Capital. Those problems, she said, were not linked to issues with the space industry itself but macroeconomic ones, such as a potential recession. She expects any venture-backed company, not just space startups, to find it hard to raise money. In space, some like Nagaraj worry that an impending shakeout in the small launch vehicle sector could leave investors, lured by advanced technologies but without a sustainable business, feeling disillusioned. “I don’t want a desert where VCs dip their toes in, get burned and then leave for another 10 years again,” he said.